The Easter Rising was the last uprising on British soil. It became increasingly chaotic and bloody, culminating after six days with the rebels surrendering. Hundreds of British soldiers, civilians and rebels died. Director Oscar Raby (who is widely regarded in the VR industry as one of its trailblazers) and his team set out to make the piece after coming across a cassette recording of an elderly Irish man talking through his role in the Easter Rising when he was just 19 years old. Those words became the backbone of the piece, with the recording being voiced by actor Liam Cunningham (Game of Thrones, War Horse, Childhood of a Leader). Easter Rising: Voice of a Rebel comes at a time when the shape of our nation has re-emerged onto the UK agenda: engaging with our past is as important as ever. 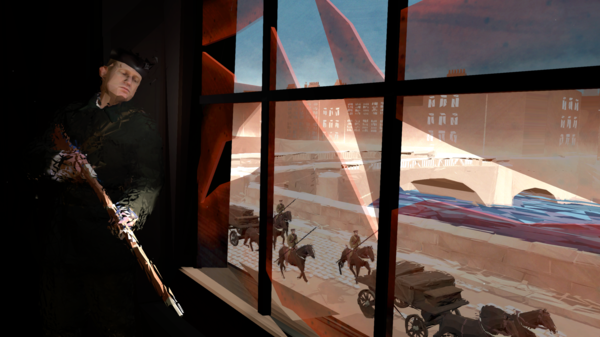 By choosing to not attempt a photorealistic period reconstruction of the rising, Voice of a Rebel's style explores the personal, fragmented nature of memory, and helps us place the notions of truth and perspective into the collective story of a nation. Producer Catherine Allen (who also curated this season) will be taking part in a free Filmmaker Q&A on Wed 14 June at 20:00 and 22:00. Virtual Reality is no longer a science fiction dream: it is increasingly an accessible reality that presents the potential for a whole new breed of cultural experience. Join us for a mini-season of live VR experiences that explore different aspects of its artistic potential, from awe to intimacy to empathy.